Speake-Marin unveils Renaissance, an open-dial, tourbillon minute repeater that announces the time as spectacularly as it announces an important new dawn for Speake-Marin. Renaissance incorporates an accumulation of knowledge and experience, and takes the classical Speake- Marin elements to another level: another level of elegance, with its slim design; another level of mechanical complexity, with its tourbillon and minute-repeater; and another level of aesthetic sophistication, with its open-dial architecture featuring harmonious bridge design and superlative finishing. 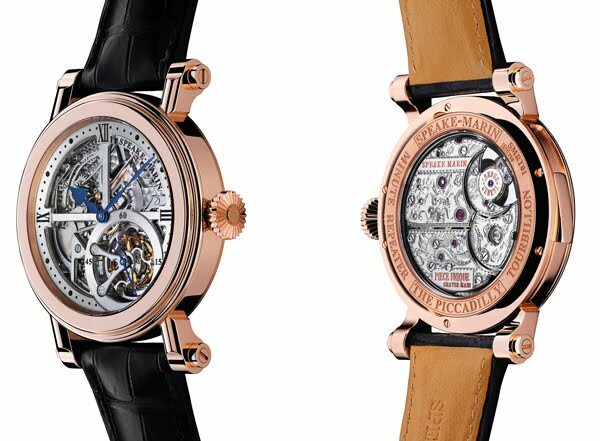 In addition to retracing all that he has worked on and developed since the inception of the eponymous Speake- Marin brand over a decade ago, Peter Speake-Marin has also drawn on his formative years working in antique timepiece restoration in Piccadilly, London where he worked extensively on minute-repeaters. “This timepiece represents a fresh start in my work, which is why I named it ‘Renaissance”, elaborates Peter Speake-Marin. “I feel as though I have been on a continual journey of discovery and education that has encompassed my time in antique restoration in London, working on collaborative projects with other brands, and with my own brand in Switzerland. The Renaissance movement was developed to Speake- Marin’s specifications by La Fabrique du Temps in Geneva. The 60-second tourbillon at 5 o’clock maximises timekeeping precision by averaging the effects of positional variations caused by gravity. But the tourbillon provides esthetical as well as technical benefits as it rotates, catching the light and the eye thanks to the fine finishing of its topping-tool shaped cage, with a heat-blued hand indicating seconds. Timekeeping precision is also ensured thanks to an isochronism-improving free-sprung balance and the lightweight, energy-efficient silicon escape wheel and anchor. The minute repeater, activated by a slider on the case band at 9 o’clock, chimes the hours, the quarters-hours and minutes after the quarter-hours so enabling the ‘reading’ of the time without having to look at or see the dial. The Renaissance minute repeater features an all-or-nothing mechanism, found on the highest-quality minute repeaters, which avoids the incorrect time being chimed if the slide is incompletely activated. The regularity of the chimes are silently and precisely controlled by a centrifugal inertia regulator, that can be appreciated through the display back thanks to its large transparent sapphire bearing. The display-back also reveals the repeater hammers and gong with ‘London-Geneva’ engraved on the repeater mainspring bridge, while the straight drum-like sides and form of the Piccadilly case and the open dial act as the perfect amplifier for the crystalline chimes. “I wanted to have a tourbillon both because my Foundation Watch features one and because of the way it brings life to the dial. It moves, it’s animated and it’s just beautiful to behold. A tourbillon emphasises the watchmaker’s art ” says Peter. “I learned about minute repeaters while restoring them in London and then continued to build modern repeaters as an independent in Switzerland. The ‘London- Geneva’ engraving on Renaissance’s chiming mechanism pays homage to London, where my journey into repeaters began, and continues in Geneva, where the movement is built. A repeater was a piece of Speake-Marin DNA that I wanted to include not just on a technical level but equally because with the tourbillon there is a wonderful coherence – the visual beauty of the tourbillon complemented by the aural beauty of the repeater. The technical, visual and aural theatre of Renaissance’s tourbillon and minute repeater is complemented by a daring open-dial architecture in which the Speake-Marin bridge and component designs are in full resplendence. And where carefully-contoured curves are juxtaposed with straight-angled lines, all parts beautifully hand-bevelled and superlatively finished. Superb legibility for reading the time is provided by heat-blued Foundation-style hour and minute hands coupled with engraved indices on the chapter ring with engraved and lacquered Roman numerals at 12, 3, and 9 o’clock. If the open dial – with its exposed micromechanics, repeater and tourbillon – is a horological work of art, turning over Renaissance reveals more superb artwork in the form of unique intricate hand-engraved designs on the movement back plate,. Peter explains: “I designed the back movement bridges so that the whole of the surface of the back of Renaissance is like a canvas where I could fully maximise the possibilities of engraving. It gives me the liberty to be able to explore many different artistic avenues. For myself these unique hand engravings complete Renaissance on both technical and aesthetic levels.